Of course we take amazing care of our senior dogs, that goes without saying, but our dogs are there for us no matter what. They snuggle with us when we’re feeling down, jump for joy when we walk through the door (or just wag their tail if they can’t jump!) and are the best companions ever. Sounds like they deserve a little extra pampering!! Massage is first on my list because aside from scavenging for food, Jack loves nothing more than a good massage. You don’t have to go through any special training just give him a rub!! Jack is a small dog and his favourite position is lying on my legs, on his back, head lolling with delight. If your dog has mobility issues, or there is a specific condition massage would be helpful for, it’s best to speak with a certified canine massage therapist to learn proper techniques. Whether it’s a doggy spa or your groomer offers special pampering sessions, it’s a great way to spoil your dog. Your old dog may not be feeling so great right now, or some of his health issues have made him a bit anxious around loud noises or in unfamiliar surroundings. He can still enjoy a pamper session if you create a spa like atmosphere in the comfort of your own home. Play some calming music, my favourite is Through a Dog’s Ear, then give your dog a bath with some delicious smelling shampoo, massaging it in with a rubber brush, then dry him off with warmed towels. Did anyone say great bonding opportunity!! Sounds a bit too much for him to handle right now? How about an oatmeal foot bath!! When given the choice of buying or cooking I choose buying almost every time, and that includes dog treats. Can you relate to my apathy about cooking? To be honest I feel a bit bad about that because there are thousands of recipes, many of them super easy, there’s really no excuse to not give it a try. One day I took the plunge and made turkey balls, and boy did my dogs go crazy!! They loved them so much they acted like they hadn’t eaten in days! The recipe was not only super easy, I was able to make the meatballs as small as I wanted and they were freezable. I had treats that lasted for weeks! I’ve been trying to find the picture I took but sadly I can’t! After writing this I have been inspired to try another recipe!! 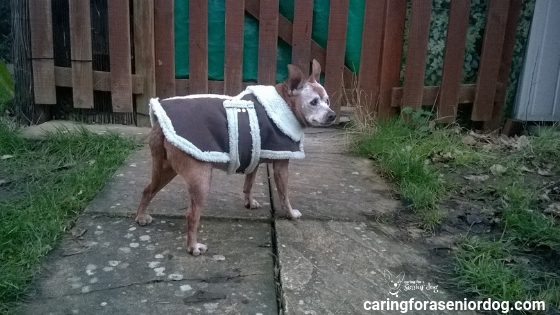 We take our old dogs for their daily walks, but wouldn’t it be great if we could do more to stimulate them and keep them entertained! 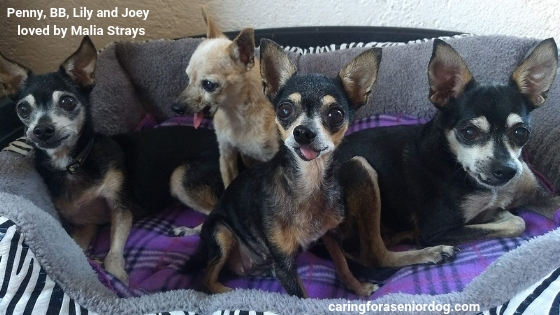 We don’t always have the time or energy to whisk them off on adventures, and sometimes their health issues make that impossible. What’s the next best thing? Creating a backyard playground of course!! It’s easy to do, doesn’t have to cost much, and any size garden is perfect! Don’t have a garden? A balcony can work too. The first step is to ensure your garden is securely fenced in, and there’s nothing lying around your dog could hurt himself on. Set up an easy to use agility course, taking your dog’s mobility into consideration. Elevate a broom off the ground using a brick at each end and have your dog walk over it. A few cones from the dollar store can create an obstacle course and a store-bought kid’s tunnel is a fun thing for your pup to play in. Entice him with a treat at the other end so he knows how to walk through it!! How about a sandbox with a toy or two hidden inside? Buy a kid’s one or build your own. If you don’t have enough space, the bottom of a litterbox should do the trick. Your dog doesn’t have to jump in, he just needs to be able to put his front legs in to dig! How about a sprinkler he can run/walk through? Anyone who works from home understands the need to be disciplined. It’s too easy to find other things to do that will distract us, and one of those distractions is the dog!! For those of us whose old dogs are sick, we keep a watchful eye over them as much as possible. If they’re resting in another room how many times do we break our concentration to jump up and check on them? Why not set up a cosy doggy space in your home office? He’ll probably feel more relaxed being near you, and you can better focus on your work. A comfy bed and blanket, a favourite toy or bone and a bowl of water are all you need. I admit this one may be more for you then your dog who probably already has an extensive collection!! Still, it’s always fun to buy a new accessory, maybe something for a special occasion? Who knows, they may realise they’re looking extra smart that day!! Whether you’re away from home a lot or you want to treat your dog to an extra bit of fun, doggie day care may be the answer. He’ll get the chance to play with other dogs, have a change of scenery and come home nicely tuckered out. Some facilities even offer the convenience of a pick-up and drop off service . 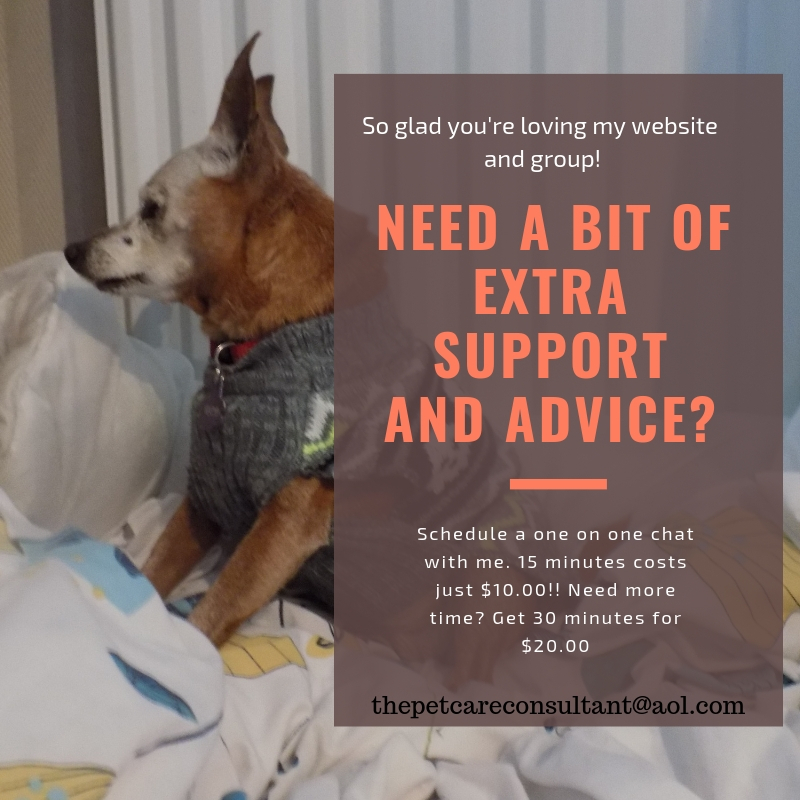 If your dog has mobility or other health issues, find out if they have a separate quieter area, or research day cares that specialise in elderly clients. You may not think your dog is up for it, but if you find a place that sounds like a possibility why not bring him with you to check it out. Worst case scenario it’s not a good fit and you leave, best case…a few hours of fun! I’ve taken my dogs for picnics at the beach and they were fun times. One summer my niece had come to visit for a couple of weeks, and since she doesn’t live anywhere near water and I live a 5 minute walk away I thought she would enjoy it. We each took a dog, I brought the picnic basket and off we went. Be sure to bring an umbrella or pop up shelter to provide your pups with some shade, enough water, and something soft to lie on. He’ll appreciate those homemade treats you made as well!! I don’t do much shopping for myself, but when I pass a pet supply store I’m right in there checking out what’s new. The next time you’re in the mood to buy your pup something, step away from your computer/phone/laptop/tablet and take him with you to an actual store. Had your eye on that swanky new shop in town? Now is the perfect time for a visit. It’s not just about the purchase it’s about a fun time for your dog. While you’re drinking Prosecco why not treat your dog to Pawsecco!! That’s right, this red or rose alcohol and grape free drink is made for dogs and cats, is veterinary approved and contains vitamins, minerals and antioxidants. Serve it as a drink or pour over your pet’s food, and you’ll no longer be drinking alone!! I know you’re already feeding your dog a healthy nutritious diet, but sometimes it’s nice to get a home cooked meal. I know we talked about how much I hate cooking yet managed to make delicious easy treats, well I can say the same about home cooking. 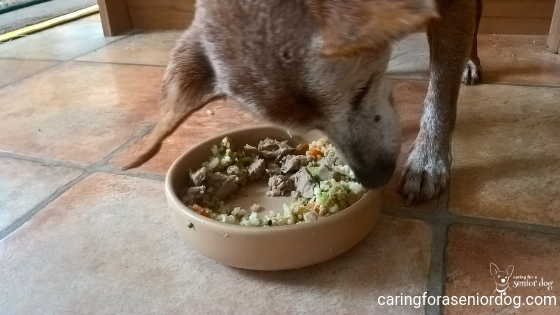 For several months I made my dog’s food on the recommendation of my holistic vet. Okay it was a bit of a pain cooking and chopping the ingredients but…I would quadruple the recipe to make a massive batch, then freeze it in small portions to last 3 or 4 weeks. There are a ton of simple meal ideas you can find online, Pinterest being your best source. Surely our old dogs are worth an hour or two of prep time every few weeks, and think of the health benefits! I’m going to state the obvious here but…please check with your vet to make sure all the ingredients are safe for your old dog. Why should humans be the only ones to have parties, our dogs deserve them too, right!! Invite other pet parents over for a couple of hours of fun with their dogs, and this might motivate you to set up that backyard playground you’ve been thinking about. Whip up a batch of homemade treats for snack time, and include a few, together with the recipe, in a doggy bag for each guest. Finally I can use the words “doggy bag” and mean it literally!! When putting together your guest list make sure your old dog won’t be too overwhelmed. The first time you throw your pet party maybe do a test run and start with just 1 or 2 other dogs, and make sure they match your pup’s energy level. Your dog is going to love a gift hamper filled with his absolute favourite things. Throw in a nice fleece blanket, a tasty bone, a fun toy, some delicious treats, and let him pull them out by himself. That’s all part of the fun!! If the weather is cold and your dog isn’t getting out as much as he should, it’s time to visit a friend and have a play date. A change of scenery and the chance to socialise will do you both a world of good. Bring along some of those homemade treats for both dogs when they take a break from all that fun! Your dog gets his daily dose(s) of exercise, but just like we get bored seeing and doing the same thing day after day our dogs probably do too. How about planning something extra special? My dog loves going on the bus. I don’t know why but sometimes he will head straight for the bus stop and just stand there. When I remember to put money in my pocket and it’s one of “those days” we’ll hop on the bus for a few minutes ride into down. I stop in at the local fruit and vegetable shop that allows dogs, walk around window shopping then head home. Jack gets his walk and an adventure rolled into one. Does your dog love to swim? Take him to the beach. How about a hike? Even walking in a different area means the chance to explore a new park or part of town. As my dogs get older (although they all came to me old! ), they are less able to handle the cooler weather so sweaters and coats are a must. I’ve built up quite a collection but that doesn’t mean I can resist when I see a particularly cute one!! If you live in a colder climate why not try a sweater and/or coat on your dog. It could make a big difference in his willingness to walk. To make them extra special why not have them personalised? After a long day out of the house I’m sure your very comfy couch is calling your name, but wait! Your oldie missed you while you were gone so how about getting down on the floor and giving him a big cuddle. Show him how much you missed him. Adding a fleece blanket or heating pad to your pup’s bed can make it even more cosy and comfortable. Thinking of buying another bed so he doesn’t have to walk too far? How about an orthopaedic bed or mat? For dogs struggling with mobility I like the style with 3 raised sides and a low front. They can lean against the sides and it’s easy to get in and out of. If you feel like treating him to a super fancy bed there are plenty fit for a king or queen. What better way to pamper your pup then by giving him your undivided attention? Whether that’s to play, snuggle or a good old-fashioned belly rub, find 10 minutes in your day to spend together. If your days are quite structured write it in your calendar and honour it like you would any other appointment. How about both of you eating dinner at the same time one evening, put your jim jams on, snuggle under a blanket together and turn on a favourite flick. Whether it’s a movie you’ve been wanting to see or it’s dog tv, it’s the snuggling and hanging out together that’s fun. As more and more dog lovers are looking for holiday destinations they can enjoy with their canine family members, resorts are going all out to offer pet friendly amenities. Whether it’s a plate of bone shaped cookies on arrival, a dog bed waiting in the room or pet friendly dishes like grilled salmon or beef tenderloin, your dog will be pampered big time. Want a pet “turn down” service? That can also be arranged. What dog wouldn’t have a blast in a bakery full of treats just for them! I’ve been to a couple and the treats looked so amazing it was hard to believe they weren’t for humans!! 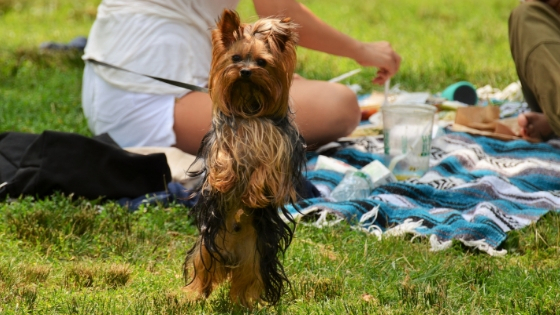 Ever noticed how many dog friendly eateries are popping up? To take that a step further, some even have menus just for the dog!! So whether you’re doing the indulging and your dog is there to watch, or you both get to tuck into a special meal someone else prepared, what could be a better date than going out to dinner with your furry companion? What’s the best pampering session of all? Spa days, new toys and dinners out aside, you can’t beat spending quality time together as the absolute best way to pamper your pooch. The time we have with our dogs passes too quickly, and for those of us who share our lives with senior dogs that time is so much shorter than we would like. How do you pamper your dog? Let us know in the comments below. Awesome post! I do a lot of these things with my two dogs (one is 10, the other is only 3) and they are great ways to bond with your pup. My oldest boy especially loves picnics and other low key outdoor adventures. That’s so nice to hear, I bet they have so much fun with you!! That’s what it’s all about isn’t it, spending quality time with our fur babies. I wish more people cared as much as you do. Oh, Hindy, I love this list! I do movie night every night with my FiveSibes, and love it. It’s the quiet calm end to a day…and I think they enjoy as much as I do…although, they do fall asleep before the end of the movie as their snoring details! BOL! I love the video of the massage – of course, none of mine would lay for that, except for furangel Gibson. He would have loved it! Pinned this to share! What a fun way to end the day Dorothy, nothing better than a cuddle on the couch with the fur babies. Nice that you include thoughts of Gibson in your family ritual, although I imagine he’s never far from yours!! Thanks for pinning. What fantastic ideas I love them, Layla would freak over the grooming or spa though as she hates going to the groomers LOL. Poor Layla!! Jack’s in agreement with her on that one!! As soon as he realises where he’s headed he puts the brakes on and we have to carry him to the groomer. Once he’s there he tolerates it, and he looks so fabulous after, but he’s not impressed at all! When he needs a bath in between my husband has to take him in the shower with him, close the door and bathe him that way. Sounds like Jack and Layla have quite a bit in common. I love this post so very much! What senior pet – any pet really – wouldn’t love this! I think it’s part of why Plush likes traveling – he has my whole focus and I spoil him rotten! Absolutely, who wouldn’t love to be pampered!! Seems like we’re so busy tending to our animals we probably neglect ourselves. What great ideas! I love the idea of massage. I’m a licensed massage therapist, but in NY I’m not allowed to massage animals. It would be my dream job to massage older pets and bring them comfort. Would you be allowed to offer massage to animals if you had specialised training? Sounds like a great area to branch into, I hope you’re able to create that dream job for yourself. Aside from cheese there’s nothing my dog loves more than a massage. 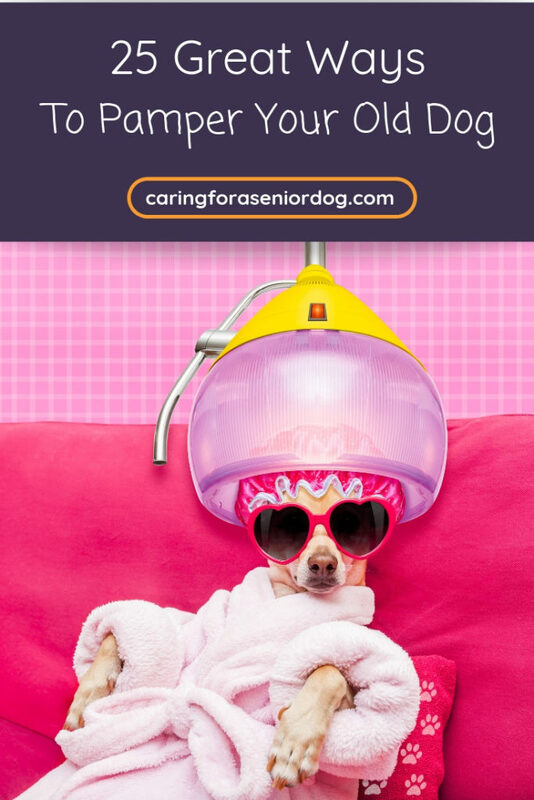 That is indeed a great list of pampering a senior dog. Any dog, really. Absolutely, dogs of any ages could benefit…and cats too! These are wonderful suggestions! I think most dogs would really enjoy almost all of these things. Thanks Beth!! It’s true they aren’t all for every dog, but there are bound to be several ways on this list any dog will enjoy being pampered. I know many will apply to cats as well!! These sound like wonderful ideas for dogs of all ages! In fact, all of our fur children, whether dog or cat, deserve the best pampering we can give them. Any animal we share our life with deserves the absolutely best we can give them!! A picnic sounds like so much fun! When we go to the dog beach, I like to bring some fruits for us all to share because my dogs, for some reason, hate drinking water when they’re not home. Bringing fruit is such a great and healthy idea.